There are four seasons, attractive in their own way. People enjoy a variety of festivals, flowers and colors in all seasons. Flowers get into bloom all together, when they hear the voices of spring. The half of spring is rainy. But rains are not too bad. They grow rice and vegetables. They call for insects including mysterious fireflies. Early summer tends to be rainy as it is throughout of Japan. Summer in Tohoku is rather short and is never too hot. Lotus flowers cover lakes during the whole month of August. The rice fields turn into yellow and await the harvest. The leaves on the trees in the mountains start to change their colors and add somehow cheerful atmosphere to otherwise melancholic season. After rice fields loose their residents, migrant birds arrive and live on fallen grains. 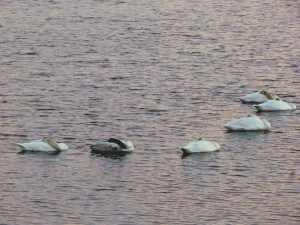 They stay on the lakes during night. Although Ottobatake house is closed during the winter months, BAKKE organizes some winter programs for special occasions.